This device monitors whether people are entering or exiting a room. It then controls all devices plugged into it, so as to minimize their environmental impact. Project team: Jake Ketchum. I have been interested in engineering since I was five years old, and playing with Legos. I have engineered a variety of projects over the past ten years, leading to the present. This year, as a freshman at Everest PHS, I was able to spend eight weeks at the Stanford Digital Fabrication Lab as part of intersession. Project Fire Jam combines software and engineering by using a Rock Band controller to control flame jets and other pyrotechnic effects. Using Frets on Fire, we aim to create an immersive and entertaining user experience. Project team: Team Fire Jam: Young Makers: Alex Jacobson, John Boyer, Sam Frank, Mentors: AJ Almaguer, Paul Novak, Joshua (Yoshi) Seaver, Shawn Neely. Alex, John, and Sam are three sophomores at the Bay School of San Francisco. Inspired by last year’s Saphira project, this year they took their teenage fascination with fire and music to the next level by creating a real life, KISS-reminiscent Rock Band experience through the Young Maker program. Saphira is an 8.5ft tall animatronic fire-breathing dragon based on the character of the same name in the Eragon book series. Project team: Team Saphira consists of makers Sam DeRose, Alex Jacobson, Joseph DeRose, and mentors Tony DeRose and David Jacobson. Water Totter 2 uses kid power from a seesaw to drive a water fountain in two ways: 1) A piston is attached to the seesaw compresses and extends as it moves up and down. 2) A water wheel lifts the water using a belt-and-pulley system. Project team: Young Sparks. The Young Sparks is a group of 9-12 year old makers based in the East Bay: Lena, Delta, Vivian, Madison, Camille, Mira, and Ruby. One of our projects this year is to enhance the Water Totter with a second method of moving water. Mentors: Kurt Fleischer, Kiki Jewell, Ashley Kayler. Original Water Totter: Kurt & Lena. We created an assault vehicle for use in military simulation games. The bottle rocket car will be powered by two sources of energy. One source of power will be mechanical and the other will be by pressure. There will be two mouse traps which are attached to the center of the car that has a pulley. The main objective of having a pulley is to have a string attached to the tip so it can wind up the back wheels. The purpose of having the a bottle attached to both of the sides of the car is to have a second power source and move the car forward. There will be baking soda and vinegar mixed inside of the bottles in order to create pressure. My project is a hovercraft which rides on a thin layer of air. My hovercraft is different compared to other crafts, because it can be driven. This hovercraft is flown by using two leaf blowers filling up a sheet of plastic as the skirt of the board. The power supply for the leaf blowers will be electricity by connecting the leaf blower to an electrical outlet. The hovercraft will also look like a car made from cardboard or another light material. The craft will be driven with a fan or another blower attached on the back of the board and tilted left or right by rope or light weight sturdy material to turn. Overall, the board will ideally be very light in order to hold the weight of a person. Students from 2nd grade through high school have created video documentaries about their Maker Project work, including learning string games (Cat’s Cradle), multimedia art projects, gardening, and plant propagation. I'm going to have a soccer or basketball sport shirt and put cool neon. I want the cool neon to show when the team player has a yellow card and if the player has the ball for the cool neon it'll blink with different colors. I will try to create a rube Goldberg Machine that will lead up to create a bowl of cereal. It will not be the easiest thing but the chain reactions will be as interesting as i can Make them. Our house is eco-friendly, partly underground and underwater. It's only powered by solar panels and hydro-electricity. It is very self-suffecient and economic. This project uses PVC to hold air pressure, sprinkler valve to release air & a bike pump. Marshmallows go in the end of the canon. Pump to 20psi & fire. The marshmallow will travel about 30-50 yards. Highly modified R/C car programmed to visually follow a circle. Uses an onboard smartphone camera running openCV object recognition software, an Arduino board, and motor controller circuitry. For our project we are going to do build a pink girly pedal car from bike parts to make it run. For the outside, we are planning on building it out of plastic. The bike parts have to make the pedal function well and we are going to ride it down on the floor instead of like a bike. We will learn how to weld. We will both be in charge of looking for places where to find cheap plastic and bike parts. Our mentors are going to help us on building the pedal car by getting the parts. Our goals combined will probably take about three weeks to accomplish. We are planning to work during flex on Tuesdays and Thursdays. Buckle-up and here we go...we have built a gokart with our dads! It rips and roars - goes forward, turns left and right. 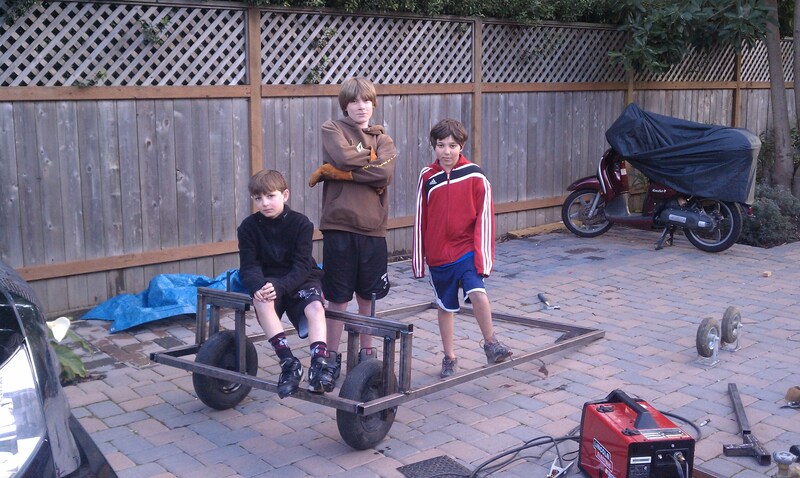 We welded the frame together, installed steering and a motor, and fine-tuned it til it hummed. The Infrared Helmet allows you to see in the infrared spectrum with an infrared light that only the wearer can see. The moving legs of my horse are based on a kinetic sculpture design by Theo Jansen. I made a prototype using a K'NEX building set - it is about 3 feet long and about 1.5 feet high. The horse is powered by a small electric motor and it walks/runs at two speeds. The final model will be slightly larger, like a medium size dog, and will be made from different materials. It will be painted and decorated to look like a paint mustang. I would like to use a flywheel instead of an electric motor in the final model. This is an electric guitar that we made ourselves and added LEDs that light up according to the stringsa being played. An LED light organ, first generation of music visualizer. Converts music input to light that's synchronized with the beat. We are creating a soccer ball that contains LEDs that would light up once the person kicks the ball. The LED's will light up differently depending on the kick. A tall, tipsy turvy cake that we've made as fun as we can! A Mad Hatter cake is a tipsy turvy cake with all kind of decorations and fun stuff. An air powered air cannon that works on the principle of pressurizing a chamber (in this case a 2 liter bottle) and depressurizing it very quickly though 1/2 in PVC piping with a marshmallow inside. This project uses MIDI to control external light setups and a sample based drum synthesizer through an Arduino board, with applications in live music performance. We took an Xbox360 controller and added an extra button that acts like the right trigger is being hit very, very fast. We also plan to custom paint it. Our young makers have built a crazy maze for their bot to traverse while creating electronic sound with a Theremin. The "No-Touch Garden" is a garden which grows independently where you, the human, don't have to care of it. It is controlled by Arduinos, has Peltier devices for climate control, and LEDs. It's totally awesome! In this project, my team and I have made a chandelier made out of plastic bottles. There was a lot of planning and redesigning that we had to do to come up with our final decision. Our project will light up when the motion of your hand is detected. When your hand does different motions, the light will light up differently. Project: Varia is a fully wearable version of the Varia suit worn by the character Samus Arun in the Metroid video game series. You saw custom-built radio controlled 60 pound to 225 pound combat robots set out to destroy each other in a bulletproof area here at the Maker Faire a few years ago. Think of a one pound mini-me version of these heavy metal behemoths designed to compete in a sport known as robotic combat. Warpig is a one pound battlebot with a powerful lifter and ultra-strong titanium armor, while Attitude is a three pound bot with an 8-inch titanium sawblade that spins at 8,000 rpm! This is a robot game in which robot shoots ball to the flying helicopter. If ball hits the helicopter then game is over and helicopter looses. Each player gets 4 balls. A to-scale and mathematically accurate rollercoaster model. It was inspired by a physics project at school, while studying energy and radial motion, and is powered completely by gravity. It is hand-made out of copper wire and popsicle sticks. Although simple, it was complex to create because of the math and intricacy it involved. A remote control boat that contains a small off-road remote control car. This boat can cross a body of water and deliver the car with a door that opens mechanically. The hull is balsa wood and fiberglass and built to specifications for the car. The car is a remote control buggy (not made by the team). 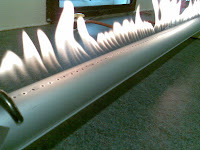 A valveless pulse jet made from steel exhaust tubing. Has no moving parts and runs on propane. A pulse jet powered the German V-1 flying bomb in World War II. Is very loud and dangerous looking. We are making a roadster go kart. It will be pedal powered, and made with PVC piping. The Mill Valley Rover is a four wheeled vehicle that is powered by a 10hp Craftsmen ride on mower engine. It has four gears going forward and one going backwards It can also turn. The PS2 controller gun is a PS2 controller that's in the shape of a gun. It uses infra-red emitters and a vertical and horizontal row of IR detectors to track the controller's motion across the screen. In this box are many wonders! Look around and see if you can find the special items listed on the paper scroll. All of these items came from many different Littlest Makers. We are investigating novel ways to interact with virtual environments. Can we make a virtual environment we can walk through and explore? Can we dance in a rainstorm made of colored hail that explodes on contact? This is being done with a green screen, computer and projector. A bow that uses water balloons as ammo. The bow uses elastic tubing and a container to shoot multiple water balloons. Our design is unconventional but perfect. We have implemented the latest in DIY technology for our wireless camera. our spy car is different from normal spy cars. our is driven by a white remote control glove that was design at our school.